But in order to select the system best suited for your business, you need to know what’s coming down the pipeline for this type of software in 2019 and the years to come. For this reason, we’ve put together the top three distribution ERP software trends that will change the landscape of distribution software to deal with the chaotic future of the supply chain. One of the distribution ERP software trends currently making waves in distributor circles is the RFID tag. This is a small label that contains an electronic circuit. The circuit is used to encode and store information about a product or delivery. For instance, if a pallet of goods were to arrive in your warehouse, you’d scan the tag and receive a detailed report about its contents and origins. Not only is this a very speedy way to process and log deliveries, but RFID tags also have huge potential when it comes to stock control and optimization. They allow you to pinpoint the exact location of goods and, most importantly, how many have entered the distribution channel. This minimizes waste because you don’t end up producing or sending out more than is needed and can have complete control of your inventory. 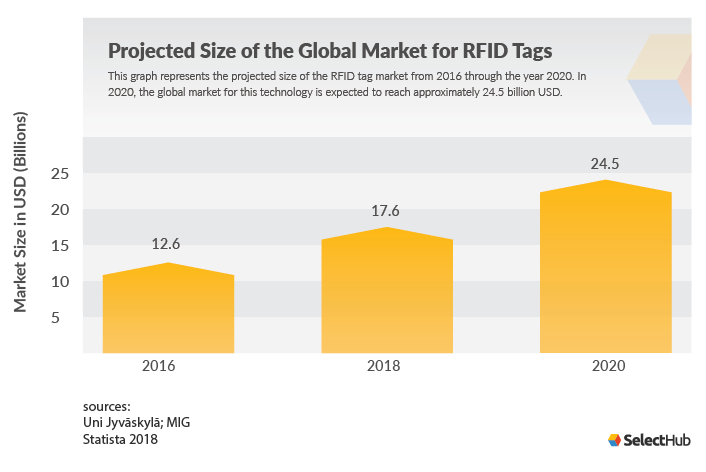 As you can see from the visual above, the global market for RFID tags has grown in the past couple of years and will continue to grow into 2019 and beyond. This projection also shows RFID tags will grow in popularity faster in the coming years than it has in the past. RFID technology is also a necessary component of the Internet of Things (IoT). IoT provides valuable insight into the supply chain by allowing managers to get real-time data on inventory and equipment in transit. RFID tags make it possible to monitor inventory that otherwise cannot connect to the internet such as raw materials. RFID and IoT technology together can provide insight into stock levels and locations, the temperature during transportation, equipment status, and more. This chart shows IoT’s growth across a number of industries, but the level of growth within the transportations and logistics field is matched by few others. Between 2015 and 2020, IoT spending within this industry is expected to quadruple from 10 billion US dollars to 40 billion. According to this data, it’s safe to say we’ll see distribution ERP providers focus on solutions to incorporate this type of technology in the coming years. To reduce human error and the cost of labor, warehouse automation is set to grow in the coming years. In addition to IoT, this trend is expected to lean heavily on RFID tags as well. The impact of RFID technology is expanded if skilfully combined with automation software. By bringing in distribution ERP software like warehouse execution systems (WES), you can increase the control you have over inventory. Every aspect of the distributor channel gets collated and recorded. So, as long as you have software that can process all of this data, there’s no part of the inventory that cannot be refined. If your pickers are having trouble meeting targets, study routes and sequences to find a more efficient way of doing things. If you want to save money, identify wasteful activities. But RFID tags and automation software aren’t the only ways to speed up processes in your warehouse. 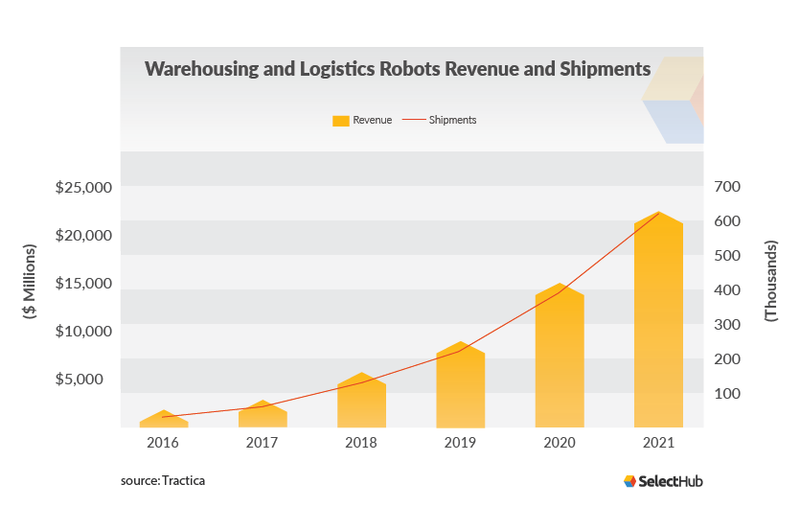 According to Tractica, the robotics market within warehousing and logistics is estimated to reach 22.4 billion dollars of worth by the year 2021. Tractica’s analysts report that this growth is due to the increase in confidence in the ROI behind robotics. At a certain point, the market that now caters to a minority of distributors will grow large enough that it will have the means to enable widespread robotics adoption. Tractica’s analysts also note the period of rapid growth on the horizon will lead to more innovation in robotics, disrupting the industry for companies of all sizes. Robots are a great choice for warehouses looking to optimize the retrieval and sorting of goods. They can be configured to find the most efficient route and may also be able to communicate with the other devices in your warehouse to avoid traffic jams. This reduces errors and increases the speed at which items are gathered, which are then brought to your warehouse workers for packing. Robots and automation software work in significantly different ways, but ultimately both provide streamlined warehouse processes and reduced costs. As these two systems grow, we’ll likely see their producers competing with one another. This is especially true in the mid-market where many businesses could find themselves choosing between one or the other. We’ve all heard a great deal about drones at this point. Even people who don’t work in the distribution sector know all about their forecasted applications. While the technology is very much in its infancy, it seems inevitable that drones will become a key asset for distributors in the future. In the UK, it’s estimated that drones will increase the GDP from transportation and logistics by 1.5 percent by 2030. If this is the case, distribution ERP software vendors will have to come up with new solutions to support them. As mentioned in the graphic above, the commercial use of drones makes up the smallest percentage of global drone investment. However, this percentage is growing steadily and is set to hit nearly a billion dollars of investment in 2021. 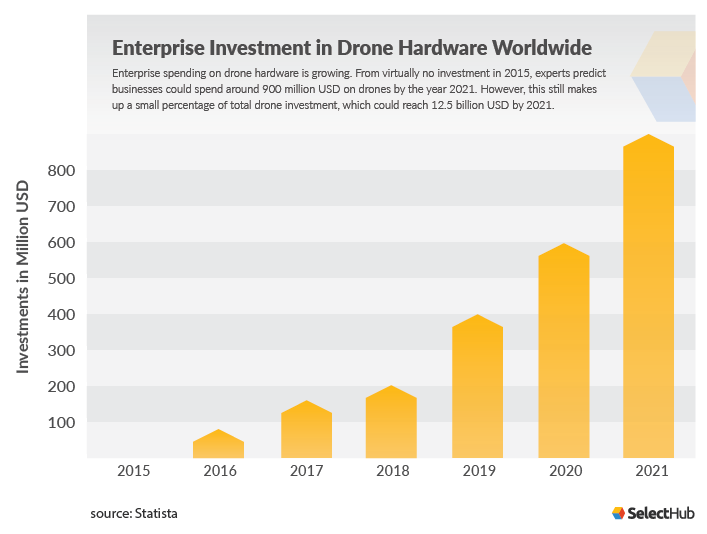 In fact, the compound annual growth rate (CAGR) of civilian and enterprise drones is expected to reach 19 percent by 2020. Drones will definitely have to prove their worth to the distribution industry before investment really takes off, but as the technology develops this is certainly feasible. For instance, some technology experts believe that, in a decade or two, drones could be plotting their own delivery routes. This would be made possible with the use of small transmitters that the customer would place in an accessible location. Then, the drone would scan for it, detect its signal and take the shortest route. Moreover, the automation drones may potentially provide could solve a multitude of issues existing in the supply chain today. In our recently published supply chain management trends article, we spoke at length on the trucking capacity crunch. Drones could be a great way to supplement delivery as the driver shortage continues and shipping rates skyrocket. However, there are still plenty of issues to iron out. For example, would the use of innovative security software be able to stop thefts? Would it be mostly automated or would employees still need to constantly monitor the drones in order to protect, recharge and repair them? Distribution companies will also have to consider the costs of these issues should they persist and determine whether the ROI is worth investing in drone technology. So far as the future of distribution ERP software trends, we can expect more visibility within the supply chain, a higher degree of automation and drones playing a larger part in distribution. So what does this all mean for businesses looking to invest in a distribution solution? A couple things. First, companies now have more options when it comes to reducing errors. Costs that were once considered the price of doing business in this industry can be completely eliminated thanks to automation software and warehouse robotics. Secondly, businesses should be ready to deal with the increasing number of disruptions to the supply chain. While many of these disruptions come from distribution technologies, adopting a distribution software will be the first defense in handling all the new changes to the supply chain. In order to find a solution that’s right for your business, you’ll need to perform an in-depth comparison of your top software vendors, much like our own distribution ERP comparison scorecard. Make sure you do enough research that you can select a software system with the confidence that it will help your business adapt to the changing landscape of this industry.